In 2008, terrorist attacks in Mumbai killed more than 150 people, injuring hundreds more. Roger Hunt found himself caught in the siege, trapped in his hotel room and defenceless against the terrorists. Hunt’s terrifying ordeal is at once poignant and captivating in its raw narration of an ordinary man thrown into the path of danger. In 2008 Roger Hunt was caught in the Mumbai terrorist attacks, and knows how miraculous it was that he survived. Following the attacks, Roger has shared some of his experiences on TV and at conferences. Roger lives in Macduff with his wife and children. This is his first book. What is 11 - 1 ? A truly inspirational book and a truly inspirational guy. A great read and a real page turner. When I first met Roger, I'd no idea that he's gone through an ordeal like this. I couldn't put the book down, his courage shines through and after all the bad press banks and bankers have had, to read how his colleagues supported him through the horrors brings a real humanity to a very personal account of a nightmare situation. I couldnt put this book down ... moving and inspiring from start to finish ! I felt I was in the same room as Roger, absolutely fantastic. Knowing Roger's story before I read the book, I found it very difficult to comprehend what he had gone through and indeed to what level. This book leaves noone with any such uncertainty. Compelling reading, you will not want to put this down until you get to the end. A story of true courage, bravery & mental strength from a wonderful family man who just happened to be in the wrong place at the wrong time. A fabulous peice of writing, I felt as if I was with him every step of the way. An ordinary man put in an extraordinary situation and he survived! Most Definately deserves to win! Emotional and compelling read which you cannot put down once you start to read it. Thoroughly recommended ! This is a highly personal and emotive account of the Mumbai terror attacks that brings to life the horror of the experience for those who had to live through it. A thoroughly gripping read. A man on the other side of the globe, on a business trip, caught up in an unimaginable nightmare. Told with utter honesty, sincerity and clarity, something that can only told by someone who has gone through hell, and survived. Told from the heart, as a need rather than a want, to inform, not entertain. A truly compelling story that I will never give away, or forget. 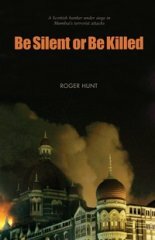 Be Silent or Be Killed is a uniquely emotional account of an ordinary individual being caught up in the 2008 Mumbai Terror Attack and feedback from hundreds of rearders has been exceptional, in particular the impact that the true account of events has had on them. This has been endorsed by the positive acclaim stated on Amazon.